Russia is down; losing an empire will do that to a country. But, counsels historian Longworth, it would be a mistake to count it out. Most empires, Longworth argues, rise and fall, never to rise again. 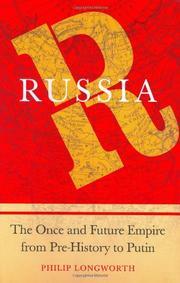 But Russia has seen four major empires in the past nine centuries, each rising from the ashes of the other. Even in pre-history, the nation saw uncommonly large populations in civilized centers, such as the 6,000-year-old Talyanky site, which was home to more than 10,000 people. The first true empire was the great mercantile power of Kievan Rus, which fell in the 1200s after forging trade bonds with far-flung nations throughout Asia and Europe; as Longworth writes, it might have endured longer but for a flawed system of succession by which families splintered into competing factions, all of which might have been solved, ironically, by a stronger centralized government. The second empire followed with the rise of Muscovy, which, “rather than striving for an imperial role…stumbled into one” following the collapse of Ottoman power in Europe. This second empire, like its successor, the Romanov dynasty, expanded in all directions, conquering and creating client states in Europe, the Caucasus, Central Asia and points east. By Longworth’s account, that eastward expansion, which created an immense colonial empire, was almost accidental; Russia’s rulers came to command it “innocently, without realizing the world significance of the fact.” That may be arguable, given the vast natural wealth of Siberia and Russia’s southern steppes, and certainly the command of the last empire, the Soviet, over the region was meant to be absolute; when communism was pressed on the native Chukchi people of the far north, they resisted, reasonably, saying that it would not increase the number of walruses. Empire is a distant memory among younger Russians. But, as Longworth observes at the close of this useful survey, “nothing is immutable,” and if history is a guide, Russia’s empire will rise again.